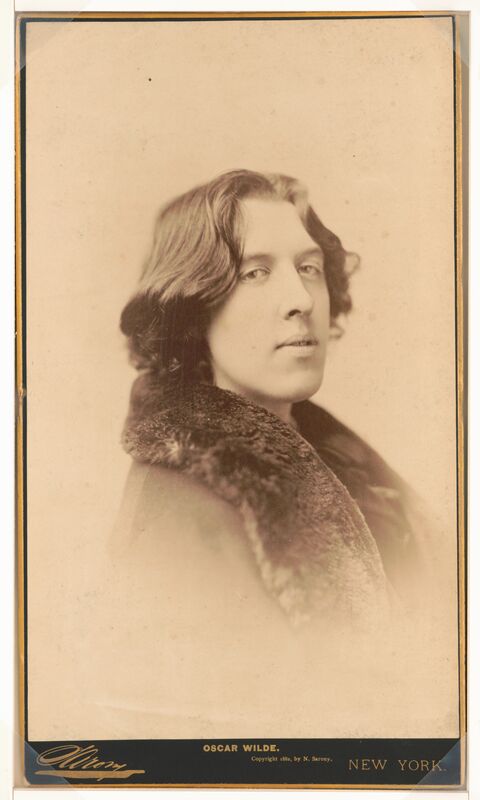 Taken at the Studio of Napoleon Sarony. 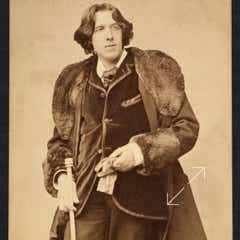 This section showcases expandable and annotated images of all known photographs of Oscar Wilde taken by Napoleon Sarony in New York City. 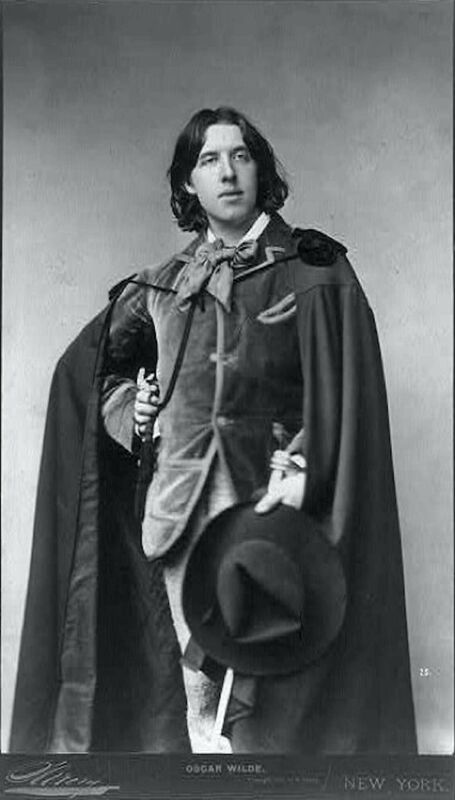 Twenty-eight are known from 1882 and three from 1883 (for a note on the number see Introduction). 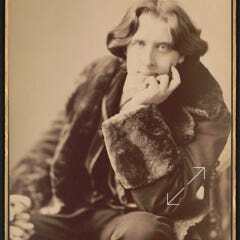 The original photographs are technically albumen silver prints from glass plate negatives first developed in black & white, but many have undergone the yellowing process familiar in old photographs. 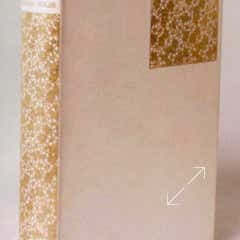 This is the result over time of chemical changes in the albumen that was used during the period to hold the silver emulsion. 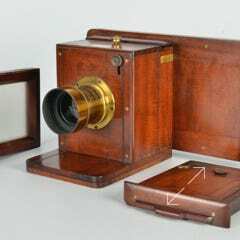 When images are uploaded to the Internet they undergo a form of digital transfer. 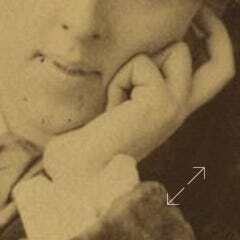 Those uploaded as a color image will retain the yellow sepia tone mentioned or any other discoloration gained over time. 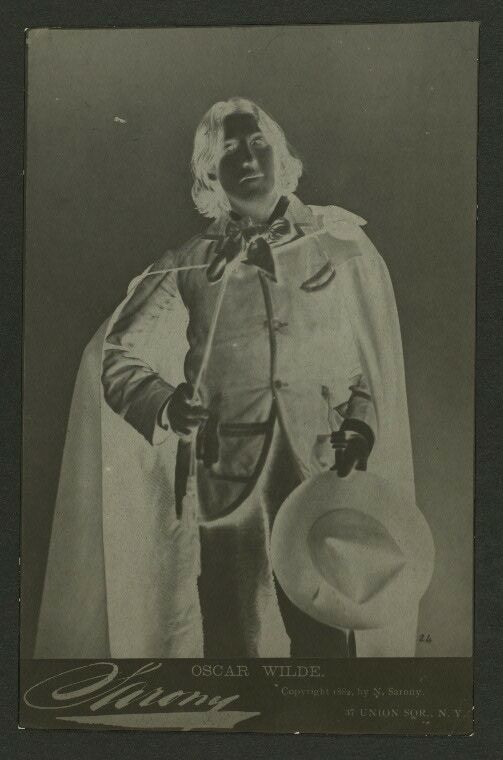 Other images may appear to be black & white but this does not necessarily imply any more authenticity or originality. 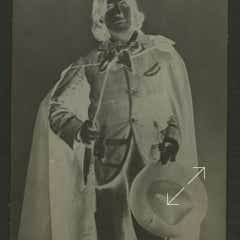 While it may mean that a better preserved print has been scanned, it equally may be the result of the image being manipulated to grayscale before uploading. 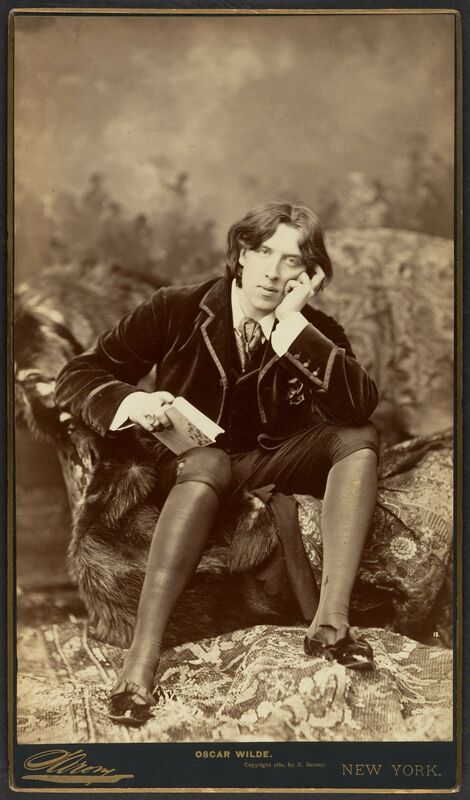 All images are in the public domain, but fair use requires the courtesy of citing this archive in any reproduction. 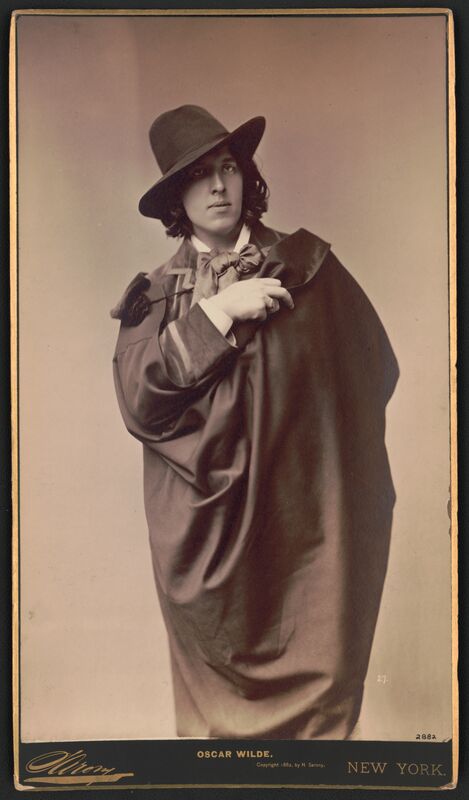 All text and research is &COPY; John Cooper, Oscar Wilde In America. 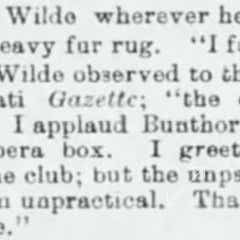 Additional dress notes provided by Rachel Klingberg, The New York Nineteenth Century Society. 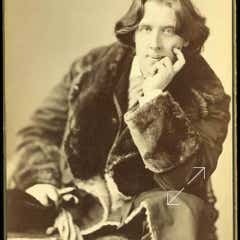 Thanks to Geoff Dibb (The Oscar Wilde Society) for his considerations about Wilde’s two fur coats. 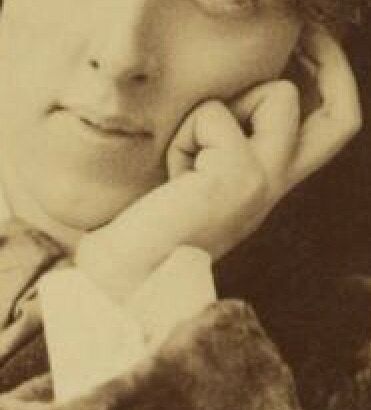 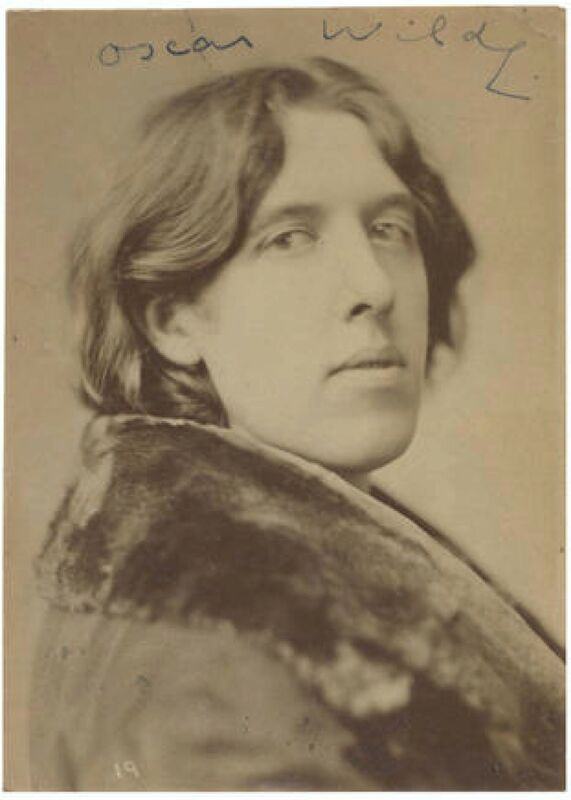 Sarony said on meeting Wilde: “A picturesque subject indeed!” Yet this first iconic headshot is the only one which has not been found with a Sarony border. 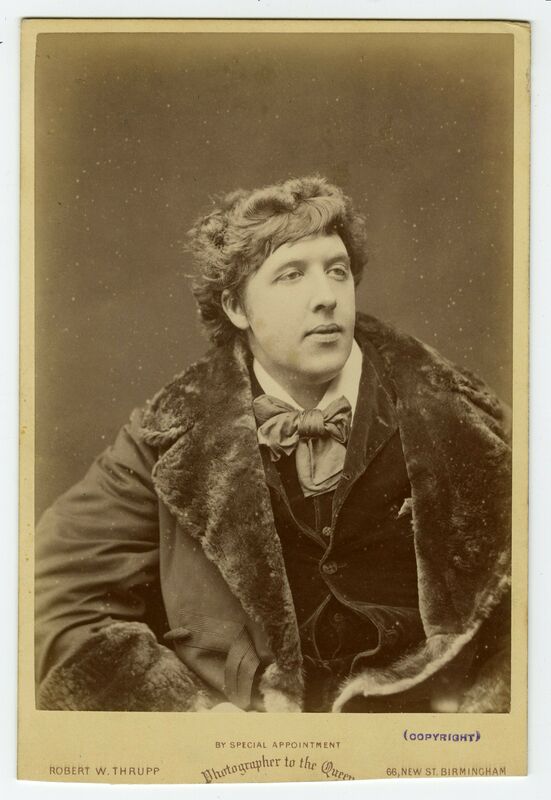 Noted as No.2 but probably taken at the same time as numbers 6· to 9. 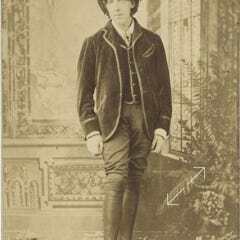 See below under Repeating Back. 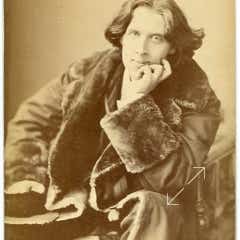 The fur-lined coat has frogging bands and toggles. 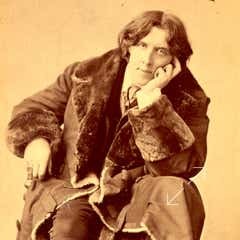 Reporters who met Wilde off the boat described it as bottle-green, with a sealskin cap perched on his head several sizes too small for him. 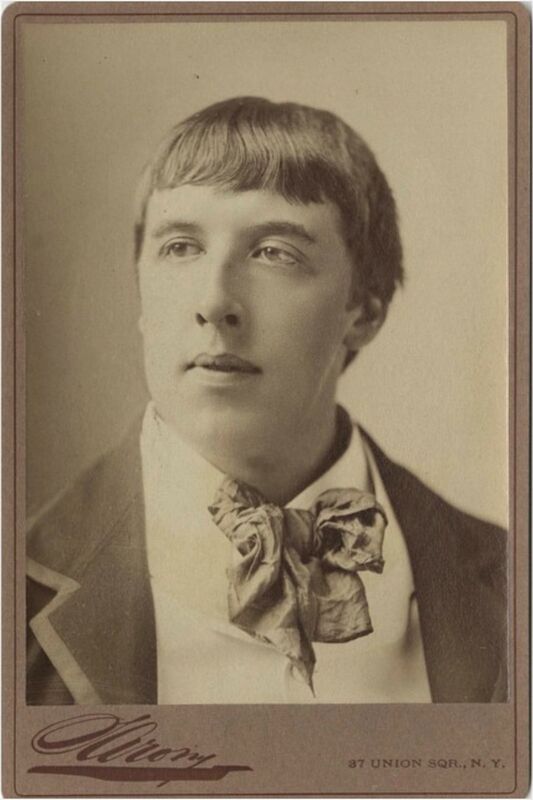 The only photograph in which post-processing is evident with the intentional fading typical in cabinet cards. 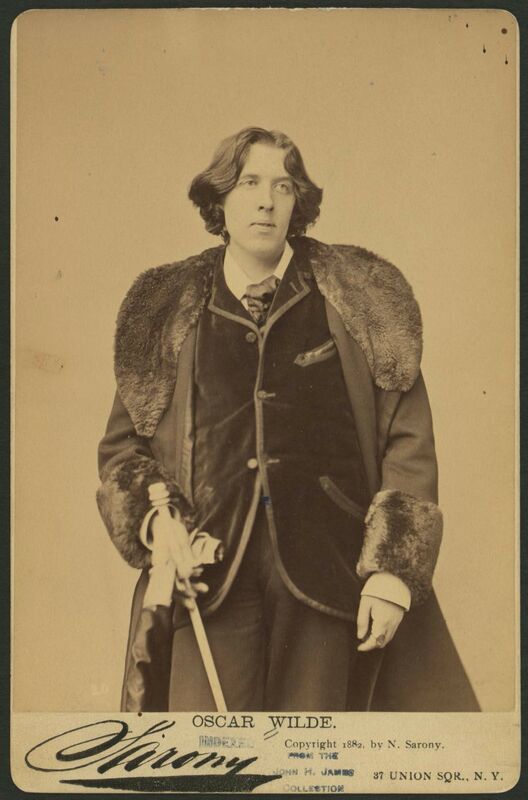 Wilde wore this fur coat for all of the pictures up to number 9. 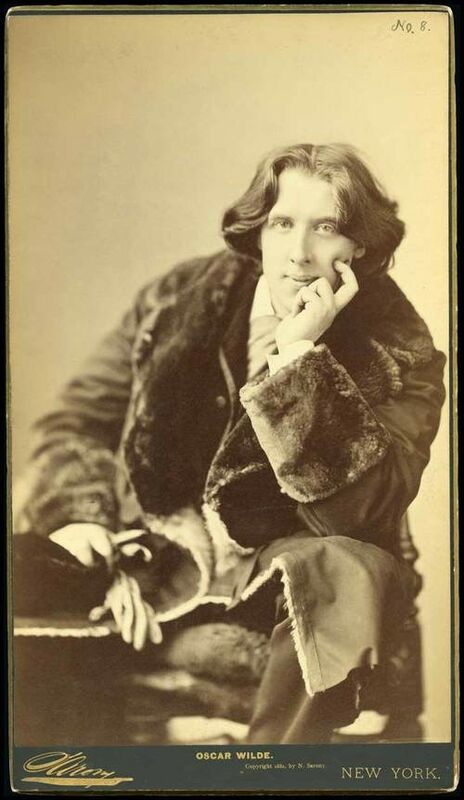 A close examination reveals that, although similar, it is not the same fur coat that he wears in photographs 19-22. 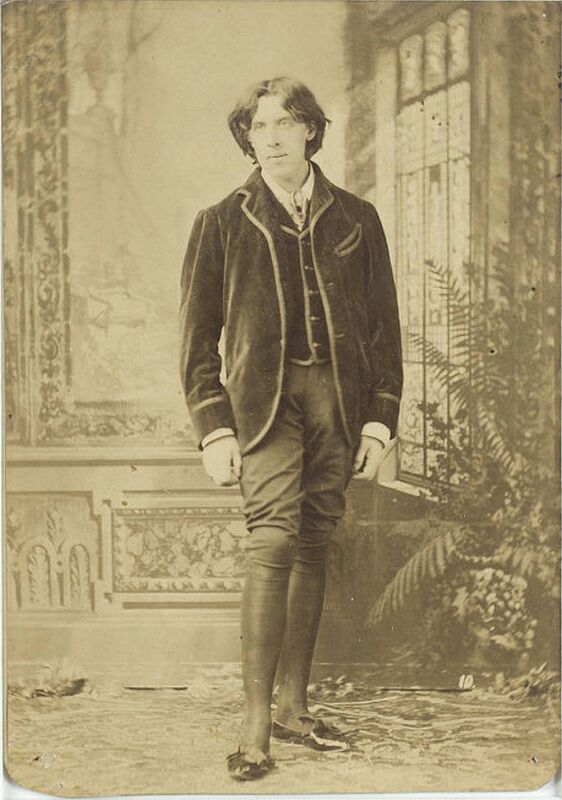 The trousers were brown, the necktie was sky blue and he carried a pair of kid gloves. 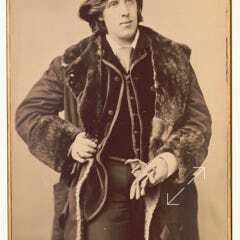 Piped velvet doublet, turn-down collared shirt under the fur-trimmed coat. 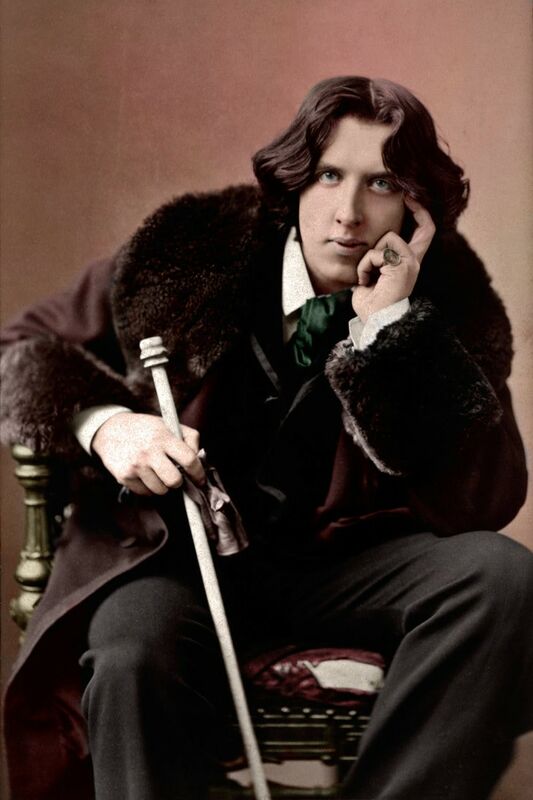 Comparable to 2, 7 and 8. 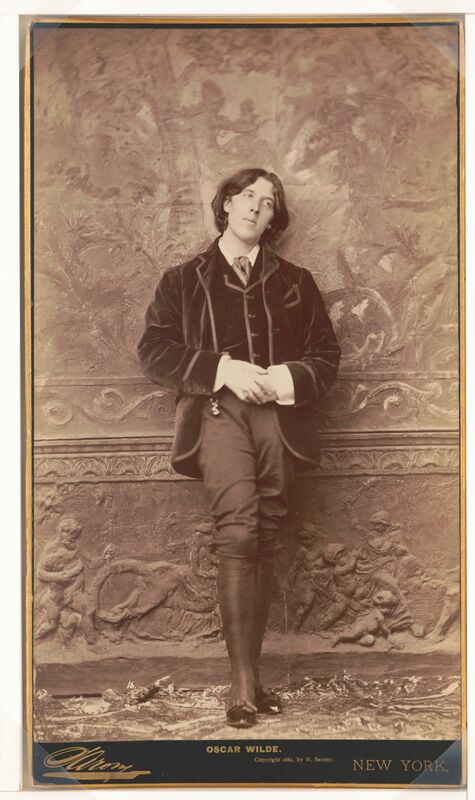 Some photographs are in pairs taken as Wilde held his pose, only slightly changing position. 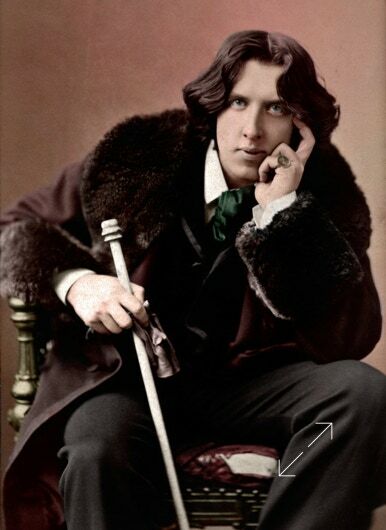 Comparable to 2, 6 and 8. 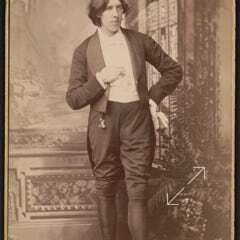 Comparable to 2, 6 and 7 with the position of the coat adjusted. 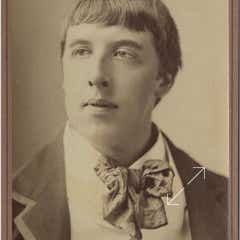 His shirt has a turn-down collar, now the norm, but unusual for the era when detached band collars were common. 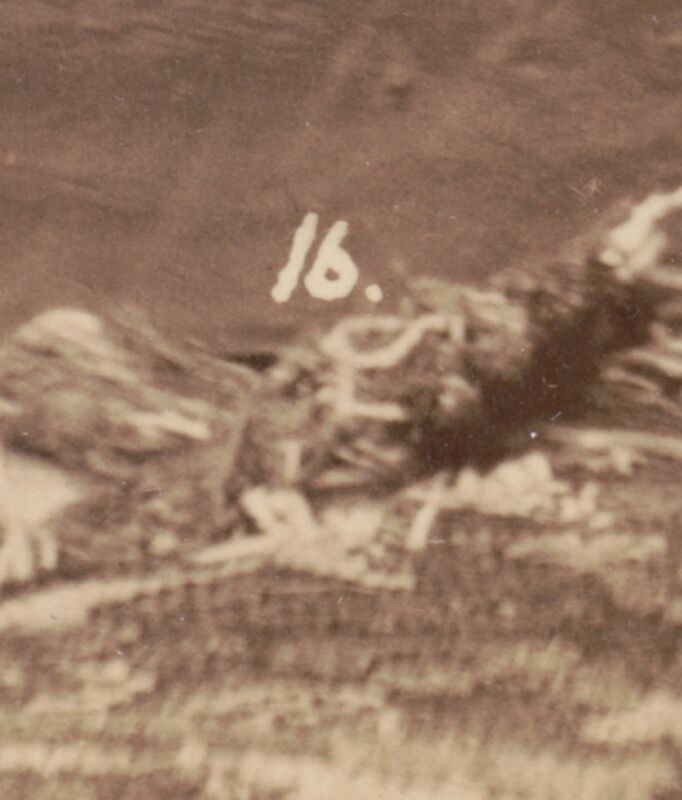 One of two photographs with the inscribed number 9. 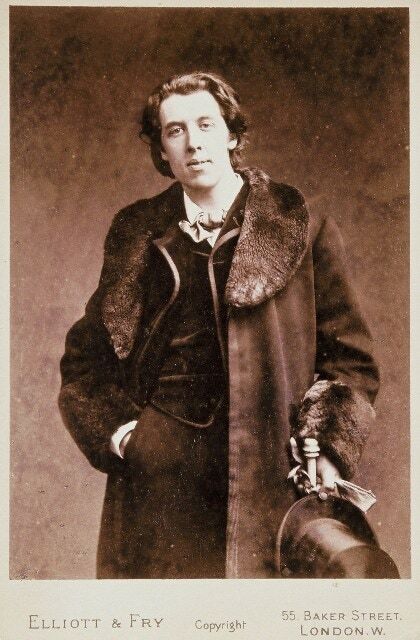 Wilde is holding a copy of his Poems (1881). 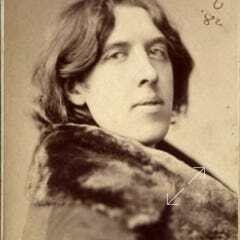 A counterpart of 9A. 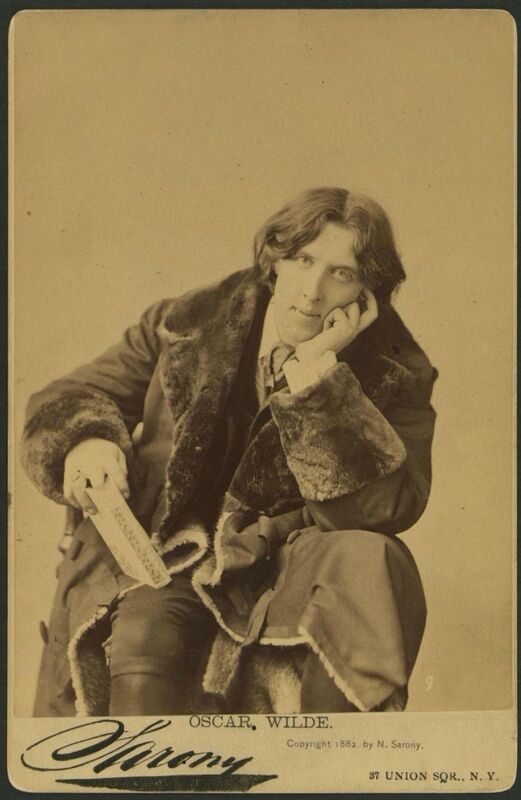 In this number 9 Wilde is not holding the book, but otherwise the pose is virtually identical. 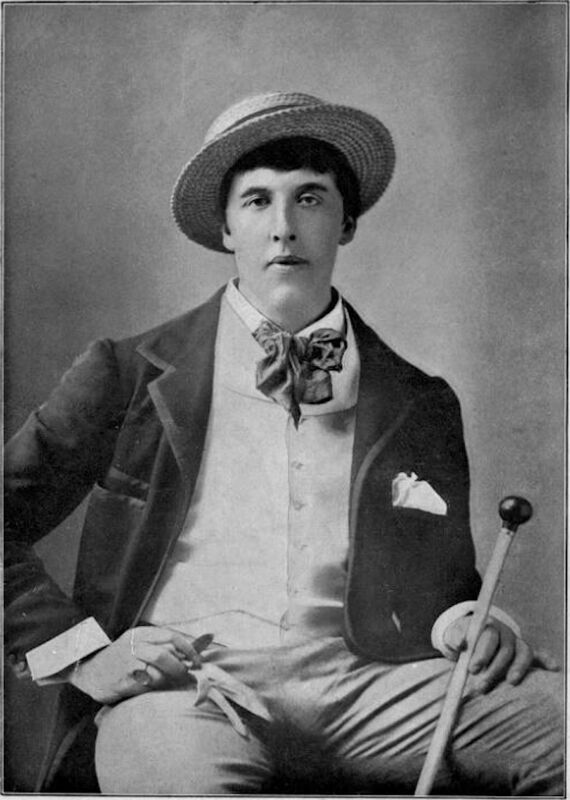 A counterpart of 11. 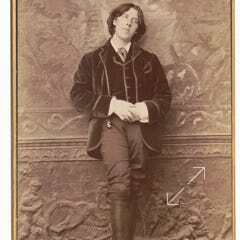 At this point Wilde removed his coat and changed into his knee-breeches, silk stockings, and patent leather slippers to “be used in the drawing-room.” But the bows were highly unconventional. 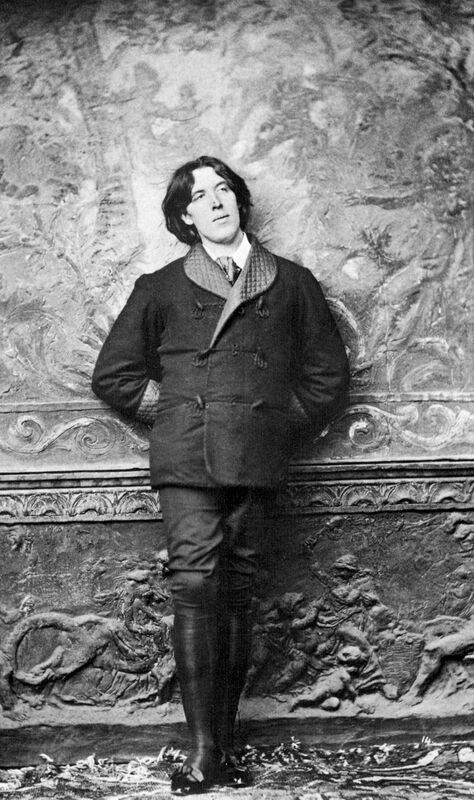 A counterpart of 10, Wilde having moved only his right arm. 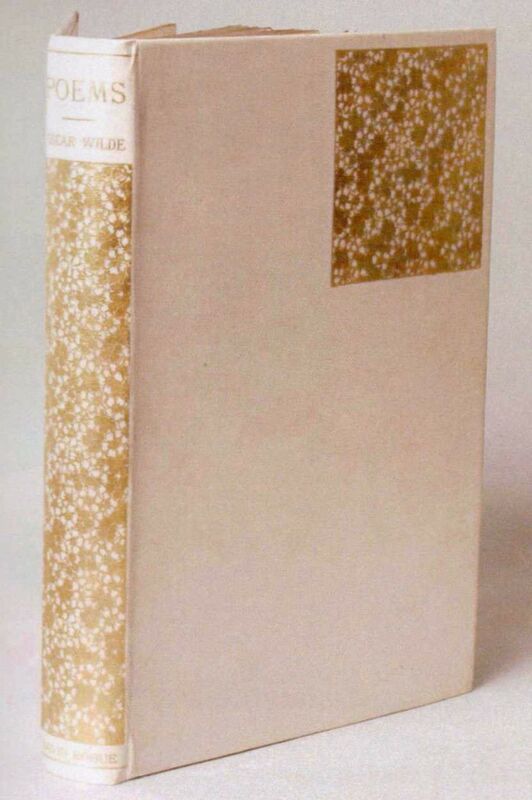 See below under Repeating Back. 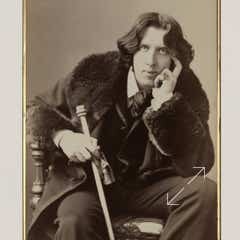 The velvet doublet is similar to a sack coat trimmed with piping at the hem and ‘smile’ pocket. 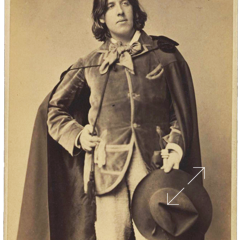 The item hanging below Wilde’s vest is a bunch of seals (used for sealing wax impressions). 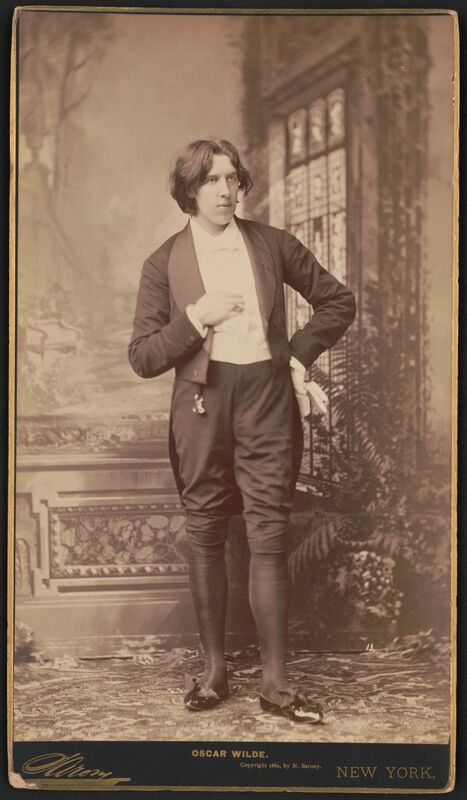 Wilde later said that waistcoats will show whether a man can admire poetry or not. 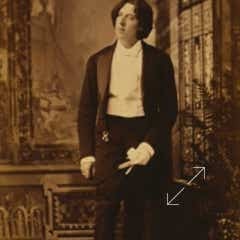 Wilde changed jacket and tie to complete his evening dress. 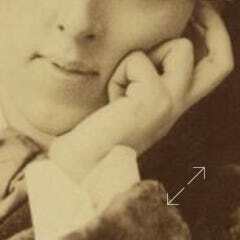 On his right hand Wilde has a seal ring (used for sealing wax impressions) which was the only item of jewelry noted by reporters when he arrived. 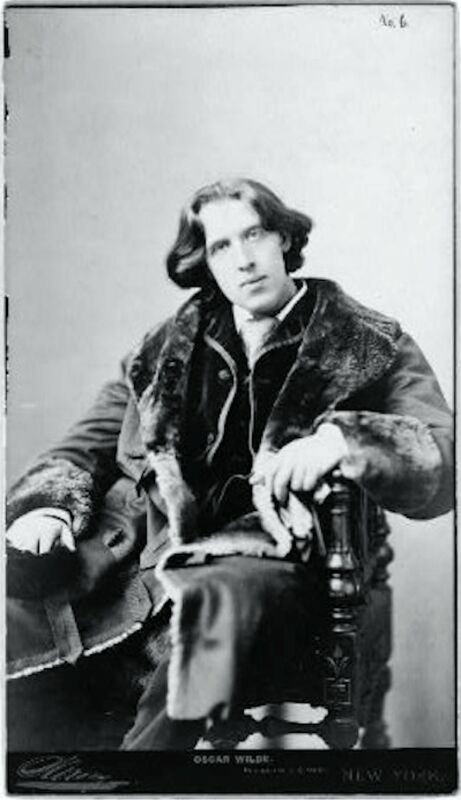 The double-breasted smoking jacket has frogged closures and satin quilted collar and cuffs. 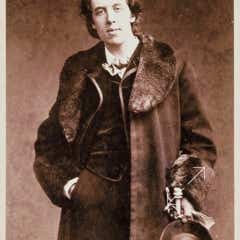 In addition to protecting clothing from ash, smoking jackets also provided additional warmth in drafty Victorian homes. 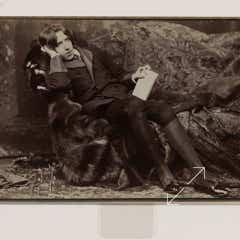 Wilde reclines on what appears to be a fur pelt (see Fur Rug below) with his feet on a Turkish carpet. 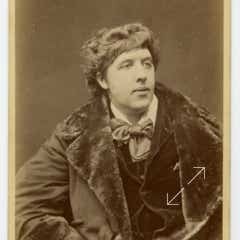 The only photograph in landscape orientation, although it is sometimes seen cropped to portrait mode. 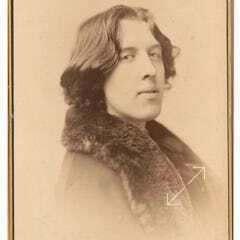 Taken concurrently with 13. 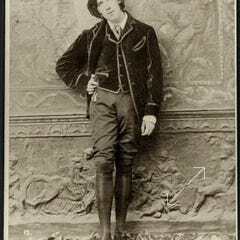 Towards the end of Wilde’s tour one newspaper quipped: “Oscar Wilde’s photographs are being displaced in shop windows by the less effeminate Mrs Langtry’s”. 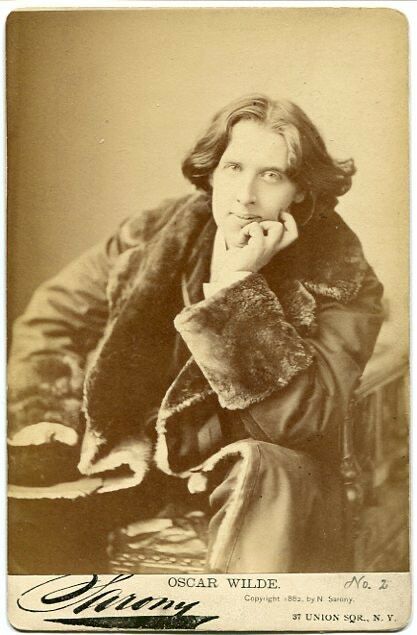 The Sarony picture of Wilde plagiarized for a trade card, leading to a famous case in the Supreme Court that established the law of copyright for photographs. 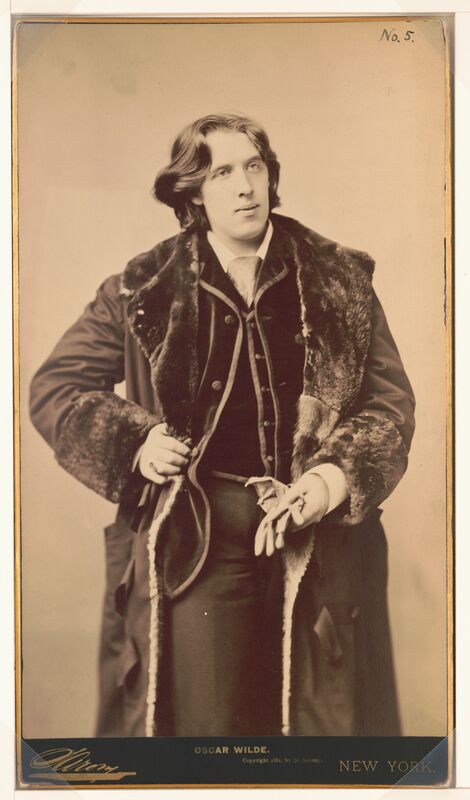 Wilde’s seal ring has now moved from his right hand to his left: probably an artistic move by Sarony. 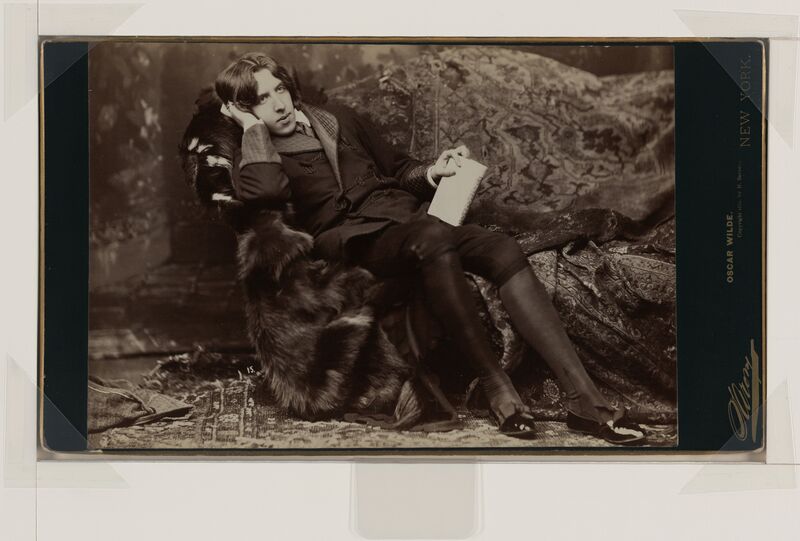 Note the tear in the chair’s upholstery. 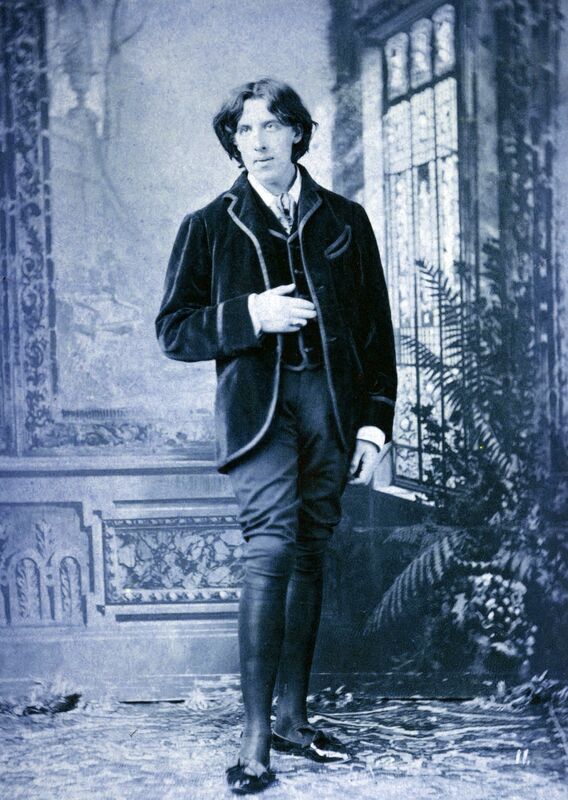 This image has been colorized at the top of the page. 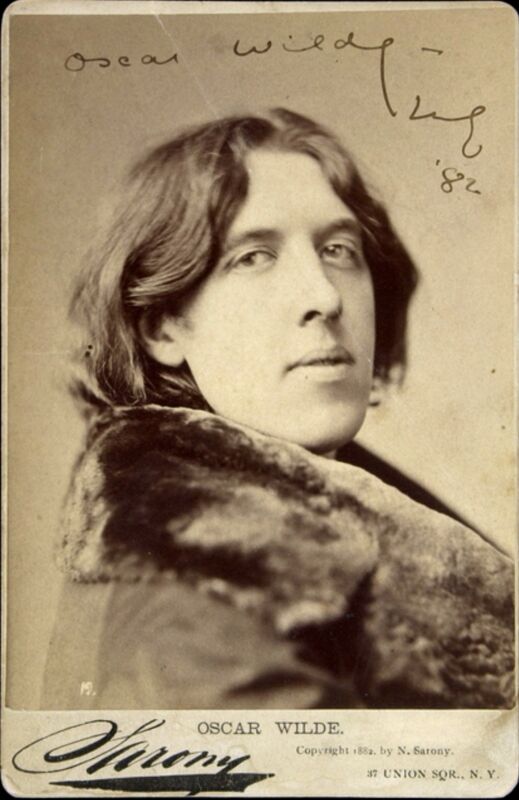 This is the photograph used as the cover to Richard Ellmann’s notable biography Oscar Wilde (1997). 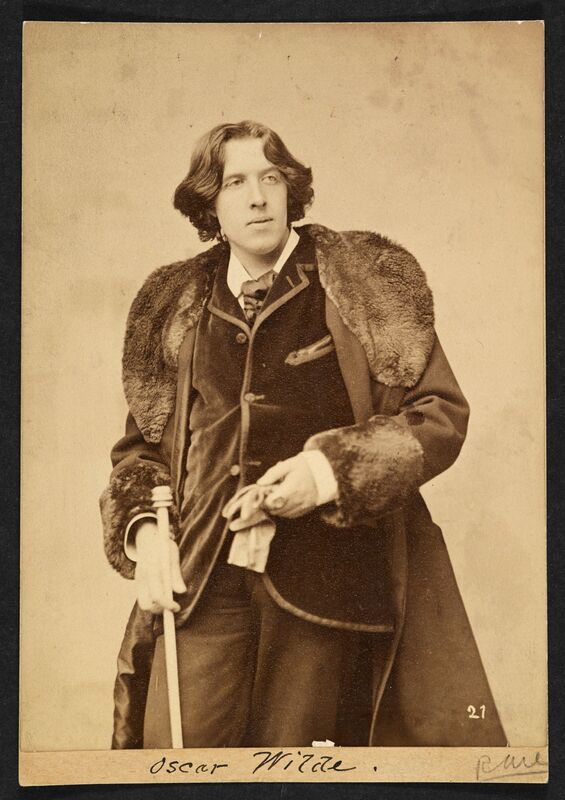 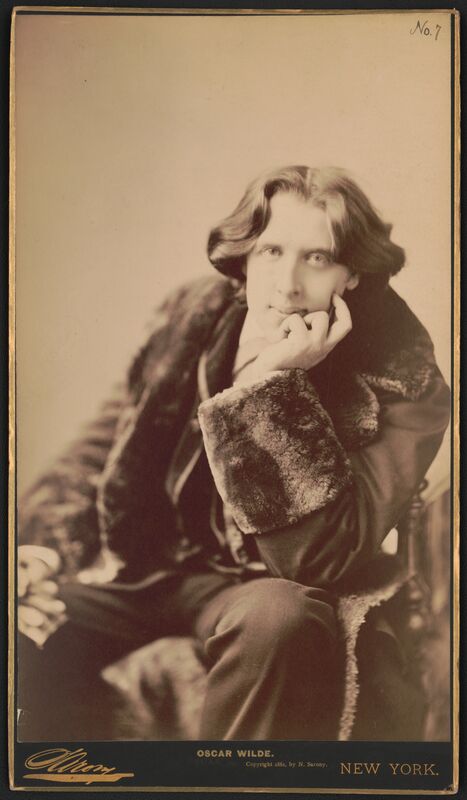 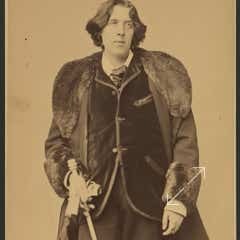 Based on Wilde’s longer hair and different garments, the last 4 photographs appear to have been taken at a later date. 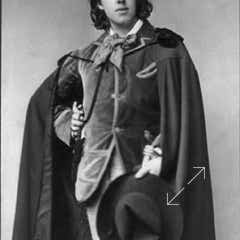 Wilde wrote: “The large hat of the last century was sensible and useful, and nothing is more graceful in the world than a broad-brimmed hat…” The style is similar to the US “wide-awake” hat. 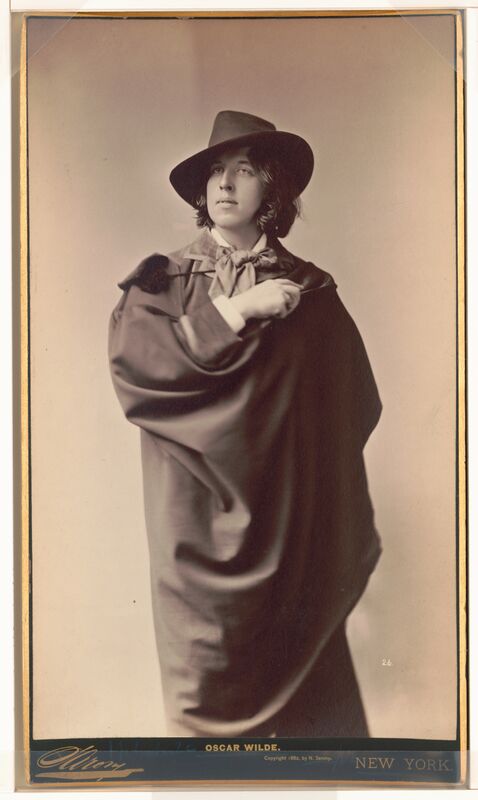 Wile thought garments should be hung from the shoulders, their natural support as opposed to tight waists, and that capes afforded the oblique line that conveys the impression of dignity and freedom. 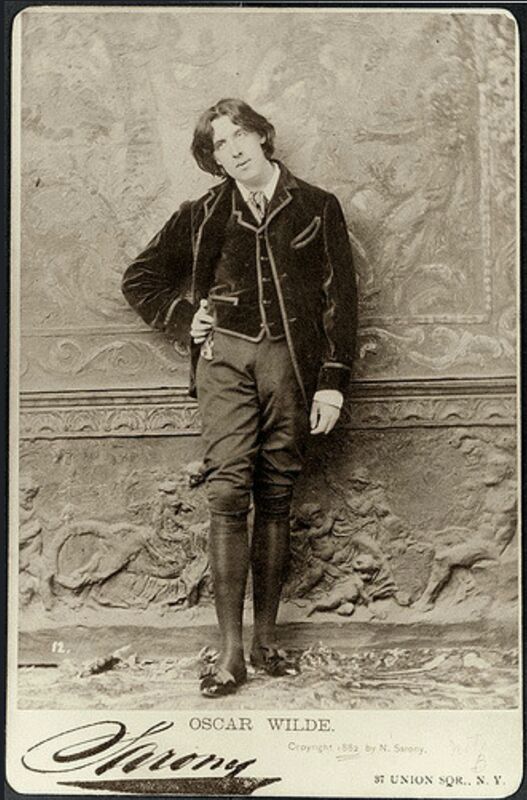 The first of three known photographs taken in the Summer of 1883 when Wilde revisited America. 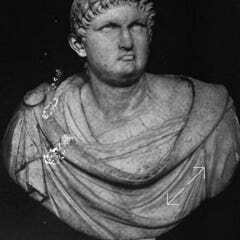 He had his hair cut short in the Spring of that year in Paris in homage to a bust of Nero in the Louvre. 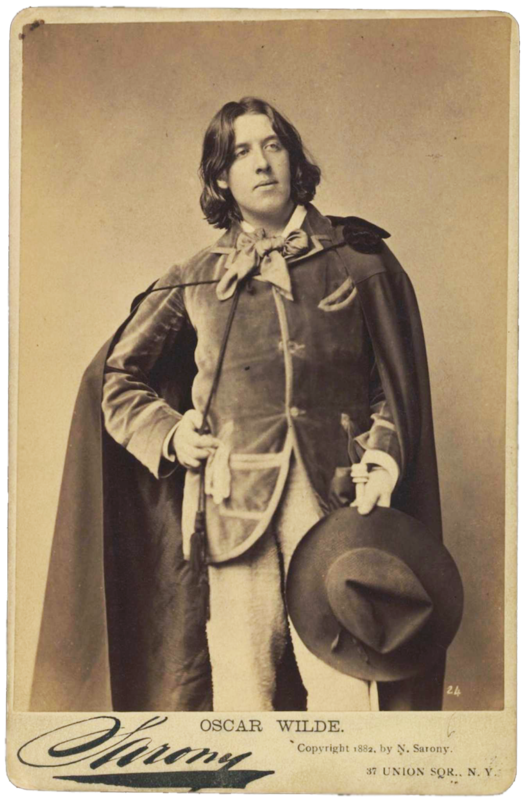 The second of three known photographs taken in the Summer of 1883 when Wilde revisited America. 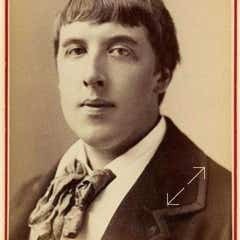 He had his hair cut short in the Spring of that year in Paris. 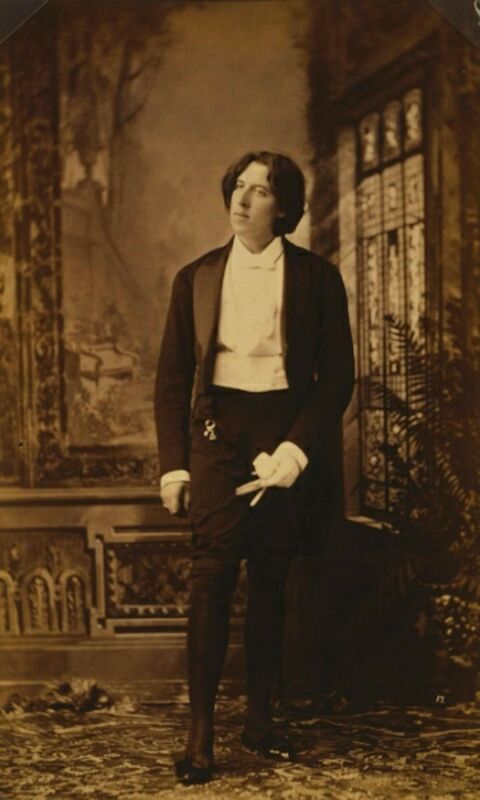 The third of three known photographs taken in the Summer of 1883 when Wilde revisited America. 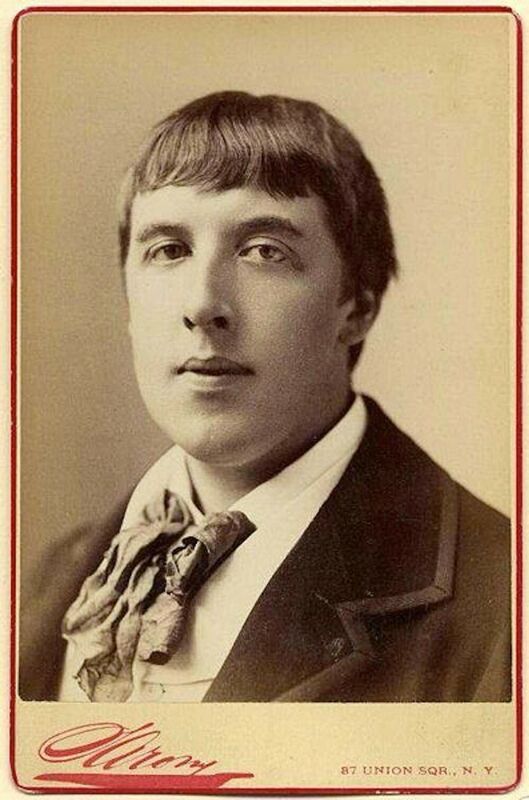 He had his hair cut short in the Spring of that year in Paris, and here he is in Summer attire. 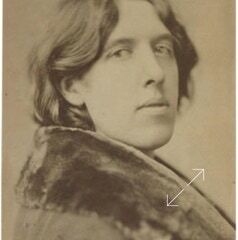 This is the book Wilde holds in several photographs. 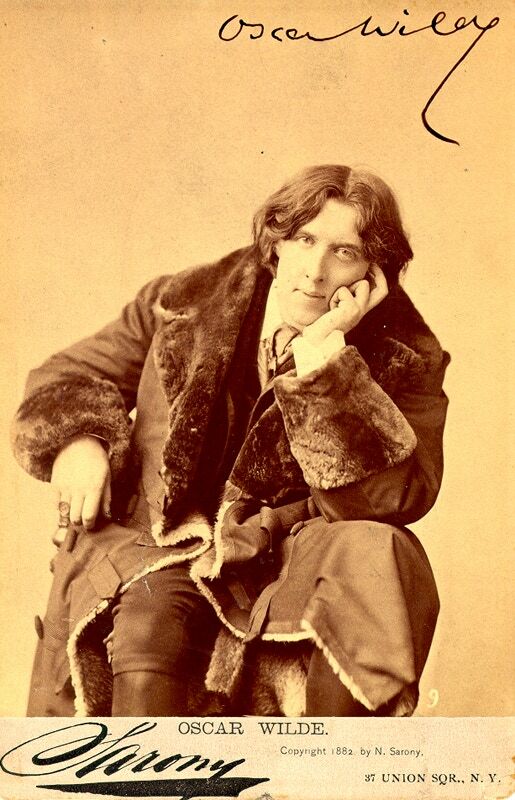 It is is his self-published Poems (1881). 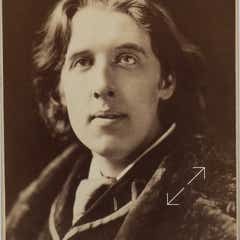 The numbering of the Sarony photographs is made possible by the inscribed numbers on the negatives (white) or prints (black). 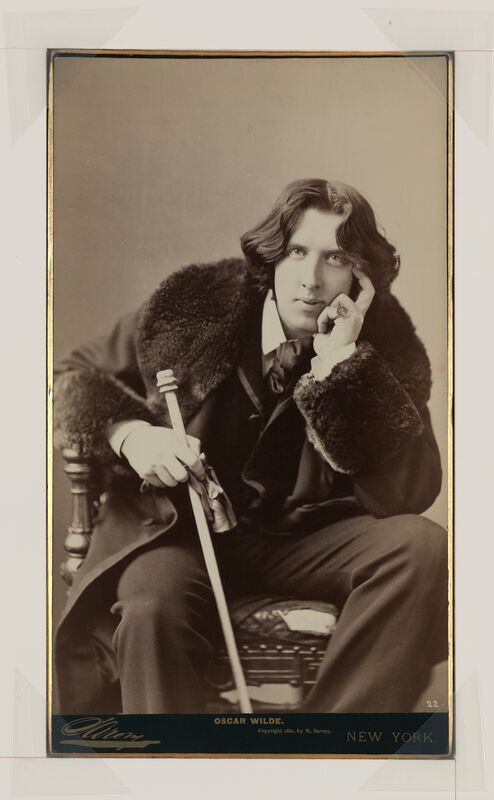 Not all have a number, but most do. 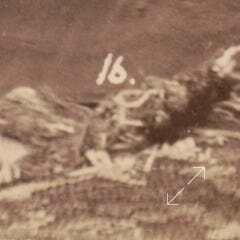 There are two number 9s. 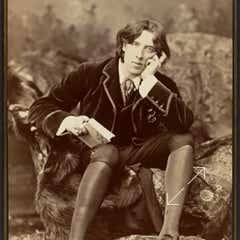 The inscribed numeral 9 in each is different, and in one Wilde is holding a copy of his Poems (1881). 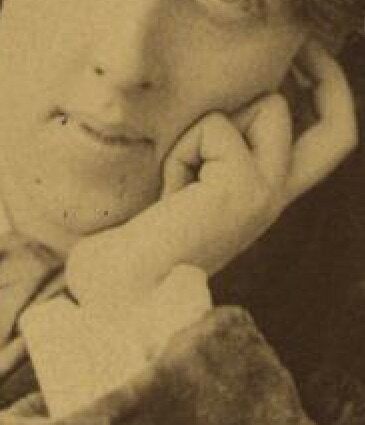 Otherwise the two photographs are virtually identical. 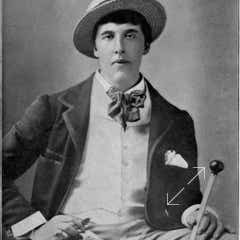 Ignoring print imperfections, and apart from losing the book, the only visible differences between 9A and 9B are the slightly altered position of Wilde’s fingers, and amount of cuff exposed. 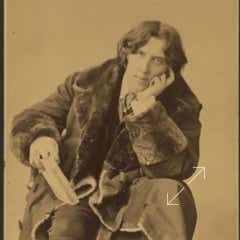 A rare negative positive, and one of the last four, which, based on Wilde’s longer hair and different garments, appear to have been taken at a later date. 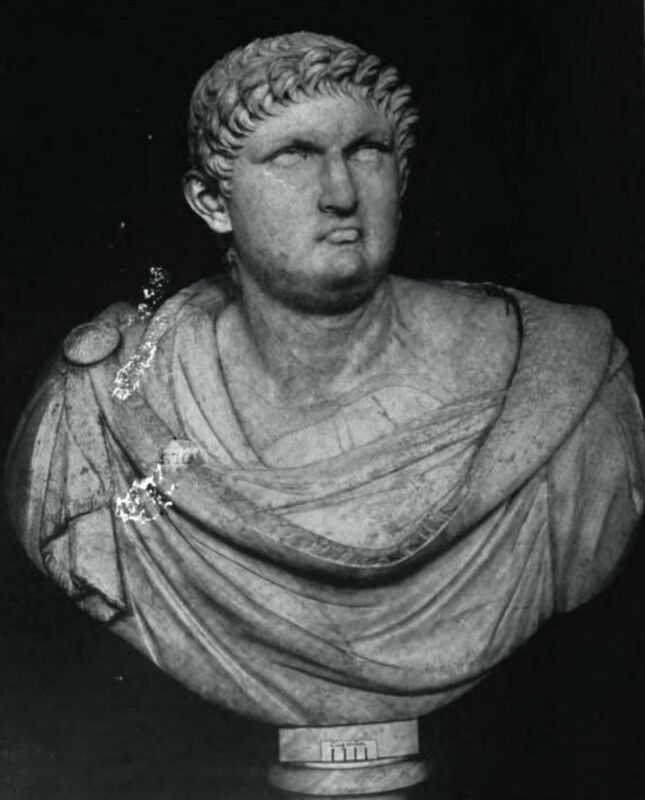 Wilde’s short hair in the 1883 photographs was inspired by this bust of Nero in the Louvre. 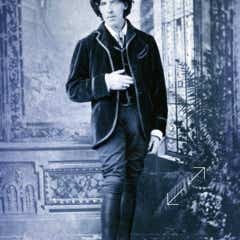 Not a Sarony picture but is this this complete Nero look? 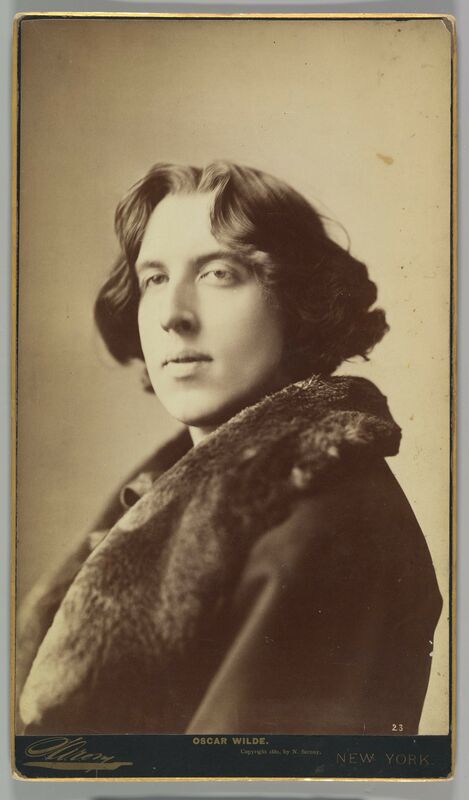 By Robert W. Thrupp, Birmingham . 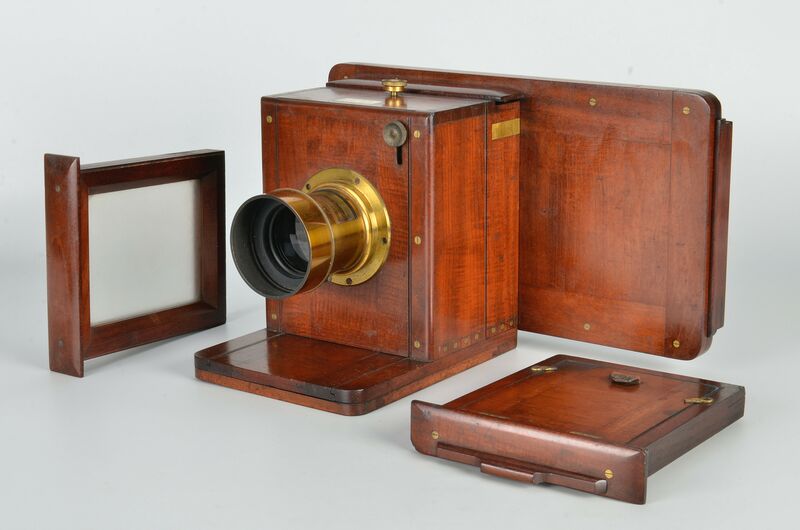 Sarony’s camera probably had a draw-slide attachment to expose each of half of a single plate. 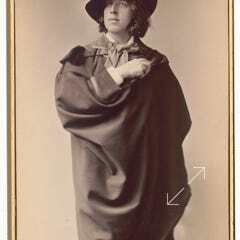 This technique accounts for the pairs of images in which Wilde held his pose between successive exposures. 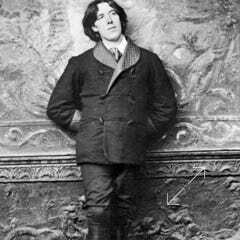 For Number 16 Oscar stood in exactly the same place in the Sarony’s studio that Sarah Bernhardt had stood in 1880. 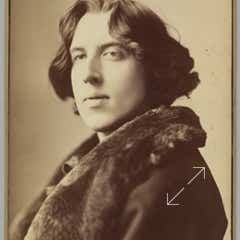 Despite differences in the alignment of the collar, the hair on the right side, and the inscribed number, this is probably just a retouched version of photograph 19 as showcased above. 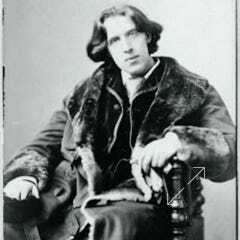 The coat in 1-9 has a fur lining, frogging & toggles, and a notched collar. 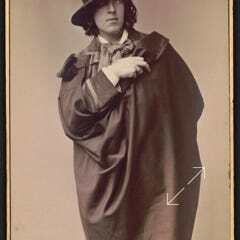 The coat in 20-23 has none of these, and a silk edging, and may have been the dress coat (rather than for travel) in this 1881 photograph.